JAKARTA (REUTERS, AFP, THE JAKARTA POST/ASIA NEWS NETWORK) - A tsunami following a volcanic eruption in Indonesia on Saturday (Dec 22) has killed 222 people, with hundreds more injured, officials said on Sunday. National disaster agency spokesman Sutopo Purwo Nugroho said 843 people were injured and 28 were missing, as of 4pm local time. “This number will continue to rise, considering not all places have been checked,” Dr Sutopo told a media briefing in Yogyakarta. The tsunami was caused by “an undersea landslide resulting from volcanic activity on Anak Krakatau” and was exacerbated by an abnormally high tide because of the current full moon, he said. Video footage posted to social media by Dr Supoto showed panicked residents clutching flashlights and fleeing for higher ground. The Meteorology, Climatology and Geophysics Agency (BMKG) said the tsunami was detected at four locations in the provinces of Banten and Lampung at 9.27pm local time on Saturday. Coastal residents reported not seeing or feeling any warning signs, such as receding water or an earthquake, before waves of 2-3 metres washed ashore, according to media. Authorities said a warning siren went off in some areas. BMKG chief Dwikorita Karnawati warned residents and tourists in coastal areas around the Sunda Strait to stay away from beaches until Tuesday (Dec 25). Residents and hotels in those areas have also been told to refrain from holding beach activities. President Joko Widodo, who is running for re-election in April, said on Twitter that he had “ordered all relevant government agencies to immediately take emergency response steps, find victims and care for the injured”. 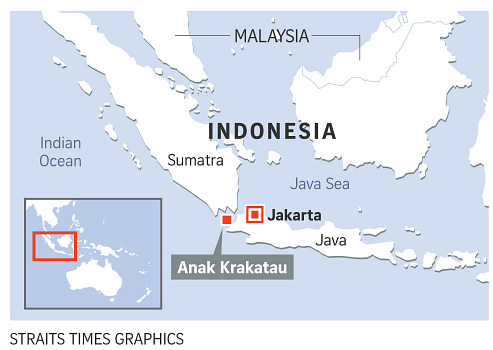 Vice-President Jusuf Kalla told a news conference the death toll would “likely increase”. Mr Sandiaga Uno, who is running alongside Mr Joko's election rival Prabowo Subianto at next year's race, shared his condolences for those "gravely affected by the tsunami". Mr Rahmat Triyono, the head of the BMKG's earthquake and tsunami department, said in a brief press conference that more tsunamis were possible “as long as there is increased activity of the Anak Krakatau volcano". “If there is increased activity, then we have to raise the alert," he said, adding that the agency was awaiting an assessment from Indonesia’s Geological Agency. Soon after the news of a tsunami broke, social media was flooded by debates over whether it was a tsunami or a tidal wave. Dr Sutopo initially said in a tweet that has since been deleted that Banten was hit by a tidal wave due to a full moon and not a tsunami, since no earthquake had been detected. A tsunami is generally understood as a tidal wave caused by an earthquake. However, the statement was revised in a press conference later in the evening, when the agency confirmed that a tsunami had indeed occurred. Mr Rahmat said the authorities were initially unsure whether the waves were caused by a tsunami. Saturday's tsunami was different from an earthquake-spawned tsunami, which is usually followed by aftershocks of a lower magnitude. Hence, the chances of a follow-up tsunami are low. “Saturday's tsunami was triggered by eruptions. Volcano eruptions can be small in the beginning and big later on," he said. Mr Rudi Suhendar, the head of Indonesia's Geological Agency, however, said he still could not rule out that bad weather, rather than an eruption, had caused the tidal surge, as the volcano had been active since the end of June and the amplitude of Saturday's eruption was not the biggest. Dr Sutopo told MetroTV there were no “significant” seismic tremors to indicate a tsunami was coming. He said various agencies were still studying to determine what triggered the tsunami. TV footage showed roads blocked by debris from damaged houses, overturned cars and fallen trees. Hundreds of buildings were destroyed by the waves, while nine hotels and 10 vessels were heavily damaged. Still, the tsunami was not as devastating as feared. Indonesia’s armed forces chief Hadi Tjahjanto, who took an aerial view of the affected areas, said he could see fallen trees only as far as 200m to 250m from the beach both in Banten and Lampung provinces. “Roads are mostly accessible, no bridge is collapsed,” Marshal Hadi told a live media briefing on national TV. So far, the western coast of Banten province in Java was the worst-hit, said Dr Sutopo said earlier. Mr Endan Permana, head of the National Disaster Mitigation Agency in Pandeglang regency in Banten, told Metro TV that police were providing immediate assistance to victims in Tanjung Lesung in Banten, a popular tourist getaway not far from Jakarta, as emergency workers had not arrived in the area yet. “Many are missing,” he said. Over at Carita beach, a popular day-tripping spot on the west coast of Java, 15-year-old Muhammad Bintang said he saw a sudden surge of water that plunged the tourist spot into darkness. Most Indonesians are currently on holiday, and both Banten and Lampung with their scenic beaches are popular tourist destinations. MetroTV reported that a live band concert was taking place at a beach in Banten when the tsunami hit on Saturday night. Concertgoers fell victim, as they were pulled by high waves. Footage showed the stage collapsing. Coastal residents reported not seeing or feeling any warning signs, like receding water or an earthquake, before waves of up to two metres washed ashore, media reported. But authorities said a warning siren went off in some areas. Lieutenant Colonel Mohamad Syarhan, South Lampung police chief, told MetroTV that holiday-makers were among the victims, but there had not been reports of any foreign tourists. “We have had reports of residents not being able to contact their loved ones," he said. The local police have deployed 200 personnel to the affected areas. Rescue workers and ambulances were finding it difficult to reach affected areas because some roads were blocked by debris, said Mr Ketut Sukerta, head of the disaster agency in South Lampung. Lt-Col Mohamad said excavators are needed to move collapsed building materials and fallen trees that were blocking the roads. “We did manage to clear some blocked roads by hand tools," he said. “The coastal residents here have their houses, made of wooden materials, as close as 15m from the beach. Many were hard hit by the high tides last night (Saturday night)." Professor Ben van der Pluijm, an earthquake geologist from the University of Michigan, said the tsunami may have been caused by a “partial collapse” of Anak Krakatau. Anak Krakatau, known as the “child” of the legendary Krakatau, is a small volcanic island that emerged from the ocean half a century after Krakatau's deadly 1883 eruption. With subsequent lava flows it grew from a submarine setting to become a small volcanic island, with the cone now standing at an altitude of around 300m above sea level. When Krakatau erupted in the 19th century, a jet of ash, stones and smoke shot more than 20km into the sky, powerful explosions that were heard in Australia and up to 4,500km away near Mauritius. It plunged the region into darkness sparked a huge tsunami that was felt around the world. The disaster killed more than 36,000 people. No one lives on the island now, but the peak is popular with tourists and is a major study area for volcanologists. Indonesia, one of the most disaster-prone nations on earth, straddles the so-called Pacific "Ring of Fire", where tectonic plates collide and a large portion of the world’s volcanic eruptions and earthquakes occur. Anak Krakatau is one of 127 active volcanoes which run the length of the archipelago. Most recently, a quake and tsunami killed thousands of people in the city of Palu on Sulawesi island in September. Successive earthquakes flattened parts of the tourist island of Lombok, in addition to the double quake-and-tsunami on Sulawesi island.